A garment which once symbolised Britain’s imperial might is marching into history, new figures reveal. Demand for men’s knee high socks has slumped, bringing an end to a century long role of traditional male dress, says high street store Debenhams. Instead, modern men are opting for ankle socks, ultra short sport socks, or in high fashion circles; no socks at all. 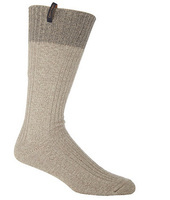 Long woollen knee high socks were once standard issue for both the British army and the navy. They were regarded as essential to protect soldiers in the trenches, helping to prevent foot rot which maimed so many troops during World War One. Officers had socks made of a softer, finer weave, while other ranks made do with coarser material. Thousands of women across the UK knitted long socks to send to the troops during both World Wars. So vital a part of life were they, that the Imperial War Museum still has a collection of knee high socks worn by British military personnel throughout various campaigns. Cold weather was by no means the only reason to wear them; long socks and shorts were also worn by the British army in tropical climates, such as India. Many former British overseas territories continue to wear the style today - police in Bermuda still wear long socks as part of their regular summer uniform. The practice of wearing long socks continued into British civilian life when millions of troops were demobilised after World War II. Many were worn with discreet calf garters to prevent them from slipping down the leg. However, the increasing popularity of central heating in British offices and homes saw knee high socks begin their first decent from grace in the 1960s. The desire of a new generation to be different from their parents in the 1970s and 1980s saw the sock fall further in popularity. Modern lightweight shoes have also made wearing thick woollen socks impractical and uncomfortable. Debenhams socks are available in all stores nationwide and online at Debenhams.com.